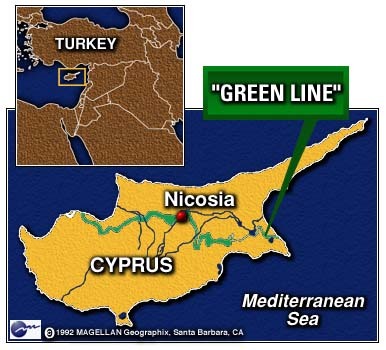 Recent Events in Cyprus: Latest Articles from Foreign News Agencies. Cyprus is the third largest island in the Mediterranean. It is situated at the north-eastern end of the east Mediterranean basin at a distance of 380km north of Ejypt, 105km west of Syria and 75km south of Turkey. The Greek mainland is some 800km to the west and the nearest Greek islands are Rhodes and Carpathos 380km to the west. The Republic of Cyprus gained its independence from Britain in 1960. Cyprus has a population of approximately 750000. (81.9% Greek Cypriots and 18.1% Turkish Cypriots). In 1974 the junta which then ruled Greece staged an abortive coup against the president Archibishop Makarios and Turkey launched an invasion "to restore constitutional order". TWENTY FIVE years on, 38% of the island still remains under the invaders' occupation in defiance of United Nations Resolutions of unequivoal substance. And the Cyprus Problem has become a major dispute in the sensitive Middle East.